Version 4 continues SignalSuite's tradition of offering tremendous flexibility in an audio test signal generator. The new version adds support for up to two stereo signal generators to be operated simultaneously. Audio Unit generator support opens up endless possibilities for additional signal types. This includes signals stored in standard audio files, which can be now played within SignalSuite by using the AUAudioFilePlayer plug-in included with Mac OS X. It also opens up the option to play back signals sent across a network from another computer, via the AUNetSend/AUNetReceive plug-ins, which are also included with Mac OS X. - Maintenance update, including minor bug fixes. I am an acoustician and perfrom a wide variety of measurements. Mostly I forced to use tools on Windows machines because of the corporate policies that require MS Windows. I do however turn to Signal Suite to develop quick examples of signals that we can use in data acquisition and system characterization. This software is complex and full-featured - something like a good dark roast coffee when all you've ever experienced is Folgers in your cup. 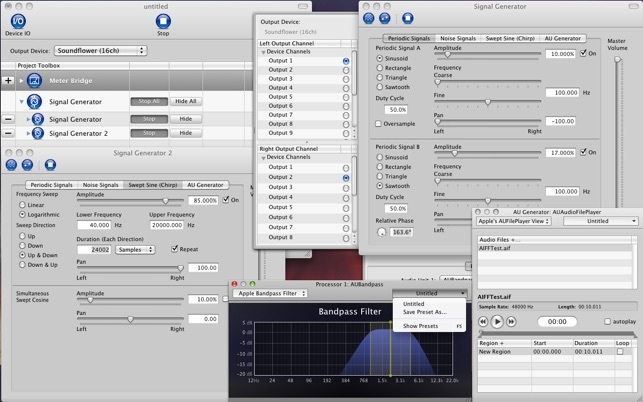 Signal Suite allows you to create the whole gamut of noises: White, Pink, Pseudo Random and Maximum Length Sequences. The lengths of the signals are variable. The tone generators can be right or left channels. As well, differnt shaped waveforms can be created. Perhaps the more fun aspect of the tool are the access to the Core-Audio filters within the Mac OS. If you are interested in a full-featured audio generation application, this is well worth the money. Does exactally what it says it does. Interface takes a little getting used to, but it comes quick. Overall very nice!